Bev Oda said Tuesday on her last day on the job as the MP for Durham that she doesn't regret charging taxpayers $16 for an orange juice and that despite numerous controversies, she can hold her head up proudly as she retires. Bev Oda doesn't regret charging taxpayers $16 for an orange juice and said today on her last day as the MP for Durham that she is retiring with honour and pride. In an interview with CBC News Network's Power & Politics, Oda refused to explain why she upgraded to a more expensive hotel during a trip to London last June and said that everyone should "move on" from talking about her travel expenses. Oda, the former minister of international co-operation, told host Evan Solomon that she was not pushed out of cabinet or asked to leave. She said she had been thinking about retirement since the winter. "It was my decision," Oda said, adding that she wanted to make sure the Canadian International Development Agency was on a good footing and then spend Canada Day in her riding before announcing her decision. Oda announced on July 3, via a notice on her website, that she was quitting after eight years as a Member of Parliament for the Ontario riding of Durham. She did not provide any explanation for why she was stepping down and declined repeated interview requests in the following days. Oda, 68, explained on Tuesday that she had already retired once, from her previous career before she entered politics, and that she now wants to get back to "real retirement" and to spend time with her friends and family. She described her international travel as rewarding but "very tiring" and said eight years is a long time. Oda said her biggest regret over the last eight years was not spending more time with her family. Prime Minister Stephen Harper replaced Oda in cabinet the day after she announced she was stepping down. Julian Fantino, who was associate defence minister, was chosen to replace her. Oda had held the CIDA post since 2007, and before that she was heritage minister in Harper's first cabinet after winning the 2006 election. Her decision to resign came shortly after she apologized in the House of Commons and she repaid taxpayers for travel expenses she had originally claimed for a trip to London in June 2011, including the expensive orange juice. The controversy was sparked by a Canadian Press report that said she was originally booked to stay at a hotel where she was attending a conference, but had her staff rebook her at the swanky Savoy hotel, where her stay cost her about $665 per night. The total bill for her three-day stay including the room and room service was $1,995. Oda also hired a car and driver, at a cost of about $1,000 per day, to bring her to the hotel she was originally supposed to stay at. She also incurred a cancellation charge for not staying at the Grange St. Paul's hotel. Oda initially defended the expenses and said all rules were followed, but later said taxpayers should never have been on the hook for her upgrade and its associated costs. She never explained why she insisted on switching hotels. Oda told Solomon that the controversies didn't prompt her to resign. When asked if she regrets buying an orange juice for $16 Oda responded, "not at all." "I had been working hard. I arrived in London, it was very late. I was working on a speech I was to give the next morning," she explained. "That cost of the orange juice was not maybe the appropriate expense for the government to pay. I've repaid that cost and I have apologized for it. "I would hope that we can all move on, I can move on, be proud of the work that I've done and have Canadians be proud of Canada's position and helping the world's most vulnerable people," she said. Oda still refused to explain why she changed hotels. "I went to London on behalf of the people of Canada. I fulfilled my responsibilities there. Any inappropriate expenses were paid by me personally. I apologized," she said. It wasn't the first time Oda had been in trouble for her spending and she also weathered a controversy around the alteration of a CIDA document that resulted in the denial of funding for an aid group. The $7-million funding grant had originally been approved by CIDA bureaucrats but Oda directed that a "not" be inserted in a document. It then appeared as though the department hadn't recommended that the funding be approved. Oda had left the impression that KAIROS lost its funding because it didn't fit with CIDA's objectives and that she had acted on her department's advice when that was not in fact the case. She testified at a Commons committee that she didn't know who wrote the word "not" and at that time she did not disclose that it was done at her direction. She later admitted it in the House of Commons. The matter was eventually brought to the Speaker of the House of Commons and Peter Milliken (now retired) ruled that while what happened was concerning and troubling, he couldn't determine that Oda deliberately misled MPs. 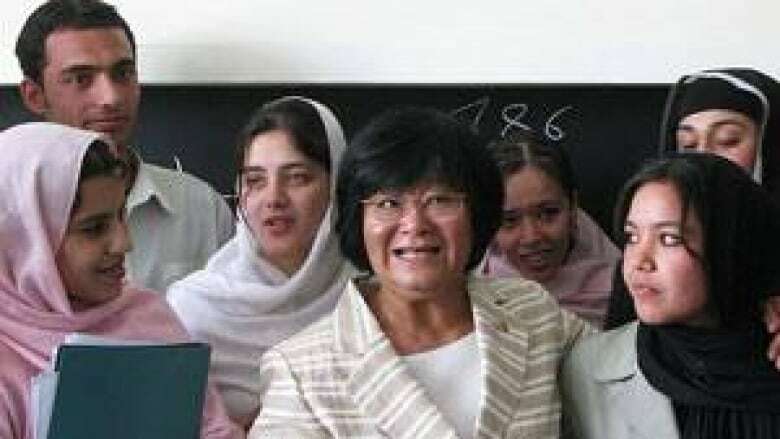 Despite her critics on the opposition benches, Oda was applauded by some for what she accomplished at CIDA and for carrying out major policy changes and initiatives including the G8's focus on child and maternal health. That initiative was also controversial because the federal government decided not to give money to aid organizations that support abortion services. Oda said Canada can be proud of what is known as the Muskoka Initiative and that the government "stepped up" and is helping more mothers and children. "We didn't shy away from potential controversy and we are making a difference. I can be proud of that and all Canadians can be proud of that," Oda told Solomon. Oda said that she often had to withstand criticism and stand up for decisions the government had made. "They were all the right decisions, the actions were properly undertaken and I'm proud of those things," she said. Oda said it takes many years for a person's legacy to be formulated and that a lot of discussion in recent months wasn't focused on "the real work" that MPs are supposed to be doing in Ottawa. She said she has received many warm messages from constituents. "I can hold my head up proudly. I'm proud to have been a part of the government and to have represented the people of my riding honourably," she said.